Fifty-One was my number today when I walked into Bio Life to donate plasma. That number represents the amount of times I have donated and the closer I get to my goal of 150 donations I have set for myself. There is no definite number of plasma donations that equals a dose of IVIG, experts say it ranges from 130-150 to make one fantastic dose of IVIG to help our children recover from KD. So as a father of a child that needed this medication more than ever, I have decided to make it a weekly goal to give plasma. 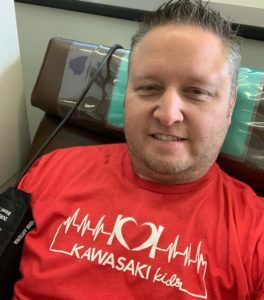 Needles aren’t so bad for me, and the place is super clean with staff that is welcoming, however it does take an hour and a half each donation. Each time I walk through the doors to give, I think of Cooper and the limp, non-responsive child that was in so much pain pre IVIG. The child that didn’t want to be held and cried with every touch! This child’s outcome was produced from the very people that sit next to me each time I donate. Sure, they pay you a couple bucks each time I donate, but I do this for Cooper and the many Kawasaki Kids that have received IVIG. Let’s talk a bit about donating blood and how that is used for IVIG. It takes considerably more donations of giving blood than plasma. Roughly 1000 blood donors are needed for one dose, giving more chance for people to help save a heart. Giving blood over plasma is by far easier with the needles smaller, less questions, and quicker to donate. However it could take me a lifetime to donate blood a 1,000 times. Small things in life come from giving, and giving plasma is my way to say thank you! Before Cooper was diagnosed, I had never heard of Kawasaki Disease, IVIG, a pick line, but these are now all household names at the Logan’s. This disease needs advocates to speak out, grow awareness, and protect these special hearts by giving back! Thank you for reading my second post and hope you find some good inspiration. Let’s make a difference in this world together. Hope to meet you all at an upcoming 5k in your state or at one of our events right here in sunny Colorado. I have made it my mission to bring KD and the symptoms to the masses, while supporting families dealing with the heart aches from KD. Make a difference today! We love to hear from you, so leave a comment below. My 4 year old son was just diagnosed with KD. I myself actually manage a Biolife and never imagined my work would come full circle! I am sven more grateful for donors like you-THANK YOU!! This is an excellent point!! I have ordered 50 or so posters from you all and will make an effort at putting them at our plasma donating centers! It will give people a reason to donate! A lot of people donate anyways, but if they new a real reason to do it and that they could in fact save a child, I bet they’d do it even more so. Did you already receive your posters? Thanks for ordering them and distorting them in your community. Those posters save lives!